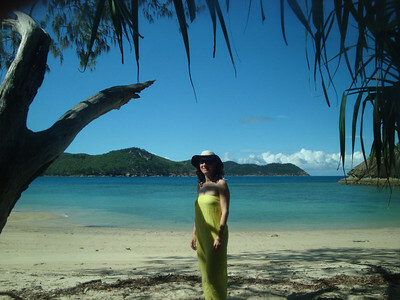 Hook Island, Whitsundays, in January. 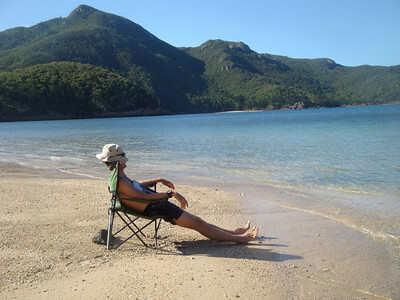 After our strenuous adventure on Tasmania's Overland Track, it was time for some serious R&R. 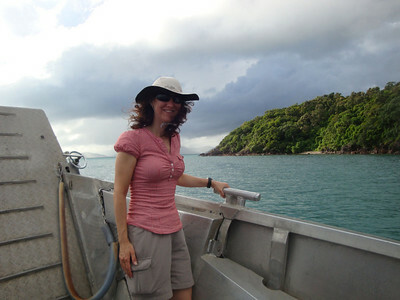 So we headed for the Whitsunday Islands, on the Great Barrier Reef. Don't miss the published story of this adventure! 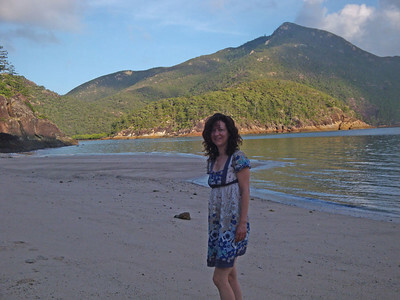 First of all, we arranged to be abandoned on a remote beach on an almost-deserted island, in the furthest reaches of the Whitsundays, for four days and nights. The 'Scamper' water taxi dropped us off with water for 4-5 days, promising to return. Or, perhaps not, we kind of hoped. 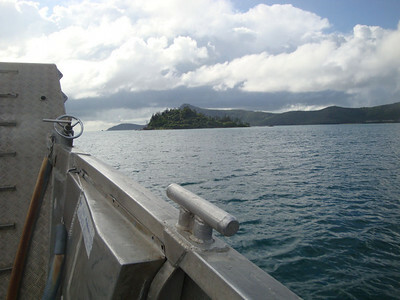 En route, we toured most of the Whitsundays. 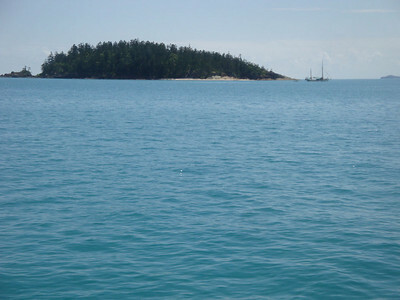 Hook Island is a long way out. 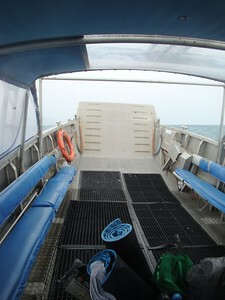 Scamper lowers a ramp like an amphibious assault vehicle, allowing access to remote beaches without jetties. 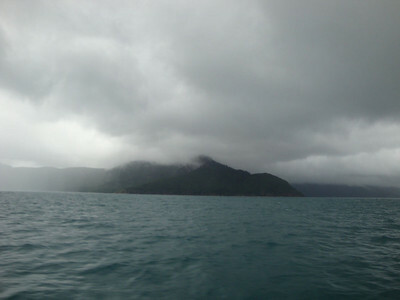 As we finally neared our island, we were disturbed to see it cloaked in ominous rain-clouds. 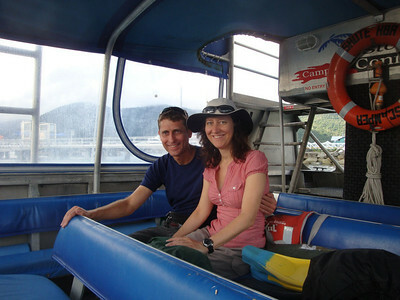 We were deposited on onto Crayfish Beach in the midst of a tropical downpour. We sheltered under a tree branch, unable to move nor keep properly dry, for an hour, until it stopped. We then had to establish a wet camp. But in time it cleared, revealing the beautiful location in which we were stranded. There was no way off our own private beach, other than attempting to negotiate nearly impenetrable jungle for about 20 kilometres, to a small resort at the far end of the island, or a very long swim. 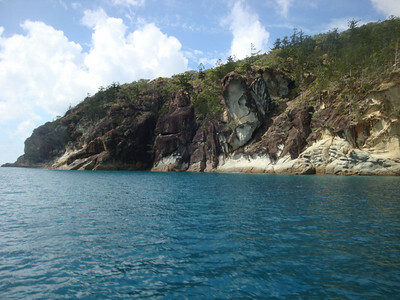 Rocky cliffs dominated the coast to either side of our bay. 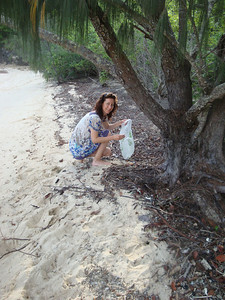 But we soon got into the swing of island life. And a dining room. 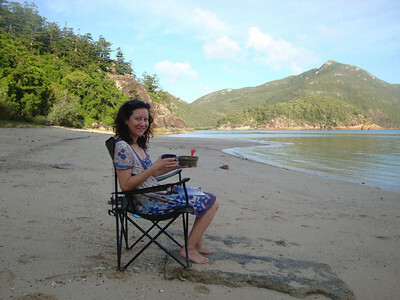 Jasmijn was plagued by ferocious mozzies at our camp, and so was unable to linger to cook. And so I brought her dinner on the beach every night. And breakfast. And lunch... I think she trained some of those mozzies. After dinner we would walk up and down the beach for an hour or so to avoid the mozzies. Dawn and dusk were the worst times of day. Stay still long enough and they'll find you. 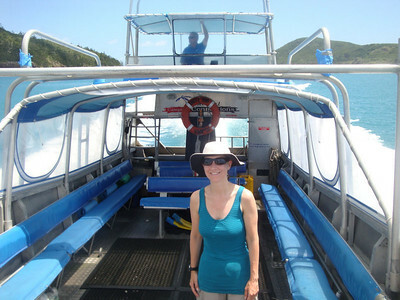 Most of all, though, we snorkelled. 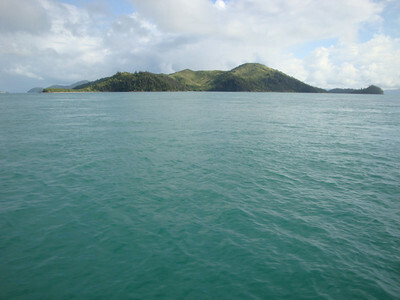 A long rocky shelf in front of Crayfish Bay is covered in coral, providing top-quality snorkelling. We went about nine times in four days. 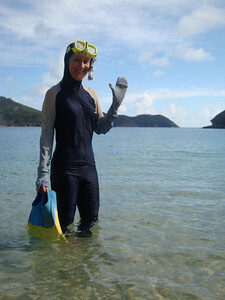 Unfortunately, Jasmijn developed repetitive snorkelling injury (flipper sores), which were treated with my first aid kit. 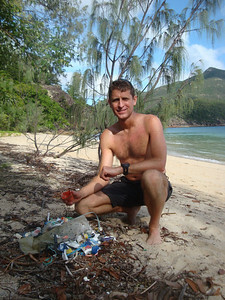 To salve our consciences about our travel carbon emissions, and time off work, we cleared the litter from the entire length of the beach, and took it out with us. 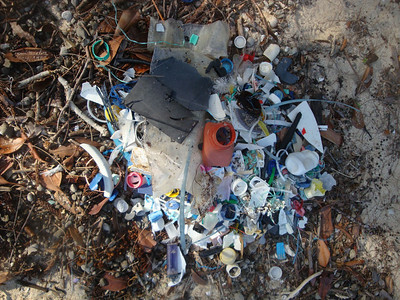 Plastic debris is washing up in quantities on remote beaches all over the world. There's even a sea of it collected by swirling currents, hundreds of km long, in the Atlantic Ocean. All of it is hazardous to wildlife. Many ingest it, and die. 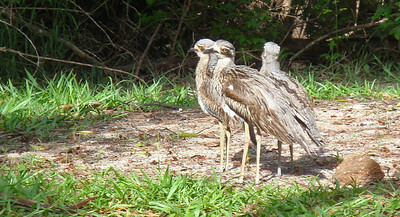 Our camp was very regularly patrolled by these long-legged insectivores, who rapidly became habituated to our presence. We missed them when we left. The camp was also patrolled by this very large lizard, who would engage in hissing disputes with the birds, presumably over territory. 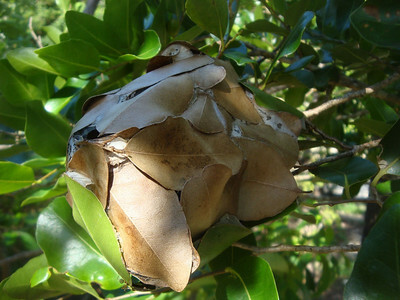 But the real powers were neither the mozzies, nor bird, lizards, or scary spiders in the bush toilet, but the tree ants. They were nearly everywhere. They did their best to colonise our tent and carry it away at one point. 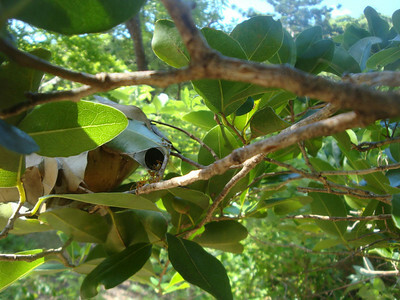 But in the end we persuaded them their own houses - which they built from leaves - had better views. 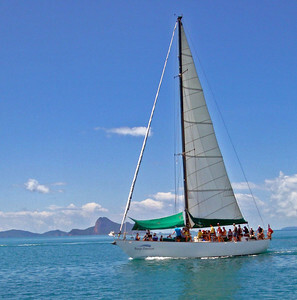 Sadly, after four days the Scamper did indeed return for us, and our return tour of the Whitsundays commenced. 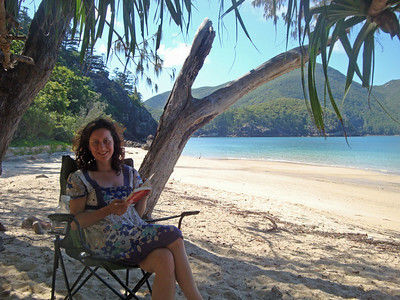 We collected some fellow campers from Whitehaven Beach along the way. 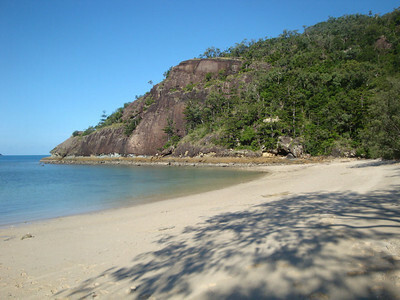 This famous Whitsunday Island beach is considered among the top 10 worldwide. 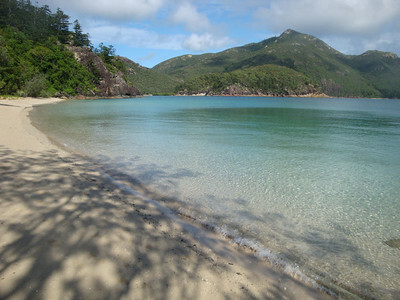 Personally, I've seen other Australian beaches as good, that are to countless to mention.